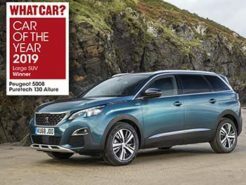 You must be eligible on the Peugeot Motability for War Pensioners scheme to benefit from this price. All models are subject to availability. The European Car of the Year 2014 has had some major refinements in 2017. With modern technology fitted, a better and more efficient range of engines and a large range of safety, comfort and automated parking features, the New Peugeot 308 brings an enviable number of features to a modern-day hatchback. 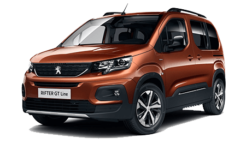 Fitted with five doors, an ample amount of space for passengers and luggage along with the Peugeot i-Cockpit for a clutter-free dashboard and heads-up driving. The general features displayed above are for illustration and may not represent the model on offer. 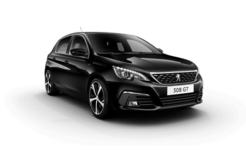 Apple CarPlay, MirrorLink and Android Auto: your phone seamlessly connects to New Peugeot 308 for easier hands-free navigation, calling, music streaming. You can even use Siri (or your own digital assistant) by pressing a button on the steering wheel. Ultrasonic sensors on the side of the vehicle offer a slicker parking experience. 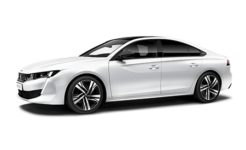 The new Peugeot 308 measures the space to see if it can fit, will let you know and fully control the steering whilst you manage the acceleration, brakes, gears and clutch. Parallel parking needn’t be a struggle with Park Assist. 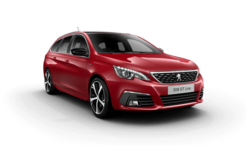 The new Peugeot 308 monitors the road ahead and if it notices a potential collision ahead, it will notify the driver. If the braking is not applied immediately then the vehicle will come to a safe stop to avoid collisions. This will happen at between 5kph and 140kph (when a moving vehicle is detected). Under 80km/h when a stopped vehicle is detected. Under 60km/h when a pedestrian is detected. New Peugeot 308 actively monitors the driver to ensure you are concentrating on the road ahead. If the vehicle notices you haven’t stopped for two hours, a warning will appear. If the new 308 notices you wandering out of lane (without indicating), the vehicle will warn you. A 180° rear video camera offers a unique 360° overhead view of your vehicle when parking. 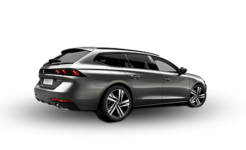 See the angle that you may think impossible in the new 308 and be assured that you are safe from obstacles when parking. 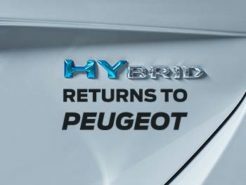 With an even better range of engines and transmission options on the new Peugeot 308, customers may feel overwhelmed with choice. 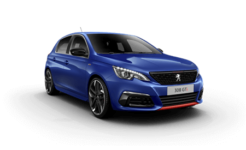 New 308 comes with the option of an extremely efficient 8-speed EAT8 automatic gearbox for the smoothest gear changes you’ve ever experienced. The award-winning PureTech range has been refined with the new PureTech 130 S&S EAT8: giving both performance and consumption improvements. This engine is now Euro 6.2 compliant (a future industry-standard for road efficiency). 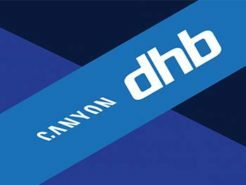 The BlueHDi diesel range has also been improved with the BlueHDi 130 S&S. Coming with additional horsepower and a clever emission-control system to ensure it complies with future standards. Drivers will always receive the best economy combined with the best power. Choose the GT trim level and you’ll be given the option of the BlueHDi 180 S&S diesel with the new generation EAT8 automatic transmission. You’ll experience comfortable gear changes at all speeds, coupled with a powerful engine to ensure you never get caught short. Would you like us to keep in touch? Charters Group respect your privacy and will not share your information with third parties for their independent use. We would like to stay in touch with you to keep you up to date with our latest product news, marketing services and offers. If you would prefer not to receive future information by either of the listed methods, please indicate by un-ticking the relevant box. Can I Part Exchange my old car towards full or part payment? Absolutely. In fact many of our customers choose to part exchange their current vehicle to reduce the overall price or use as full or part payment towards their next car. You can part exchange any vehicle with us and getting a quotation is made even easier thanks to our online form here. I'm worried about getting accepted for finance can you help? Many of our customers are apprehensive about applying for credit. We talk you through every step of the way. Whilst our online finance application process eliminates the embarrassment, many customers may need individual guidance. That’s why we’re always here to help. Through our many contacts in the industry, we are able to offer the very best interest rates for your purchase and whether you’ve been denied credit in the past, our staff can advise the best course of action. If you’ve had difficulty being accepted for credit before, we urge you to discuss your current situation with us so we can better help you. Is applying for finance online safe? Absolutely. In fact our online finance application is made for our customers who want the security of a regular application but the convenience of completing it in the comfort of their home. Notice the green lock in the address bar of this window? That means that this site (Charters Digital) is SSL secured and all data sent to us is encrypted. Your data is important to you and in a world where so many dealerships use unencrypted forms, Charters thinks differently. Applying for finance online with Charters is as safe as if you were in our showroom (which you are welcome to do seven days a week). Please note that once you click the “SEND” button on the finance application, this is accepted by Charters as a “Digital Signature” and will be treated as an acceptance that you wish to apply for credit approval process. Your credit scoring will be checked and we will contact you with the result of this. What is Just Add Fuel? 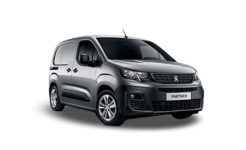 Offers listed on Charters Peuegot are examples only as each Just Add Fuel quote is tailor made to your individual circumstances (due to insurance purposes). For example, a person who keeps their vehicle in a garage is likely to get a lower quote than someone who doesn’t. Up until recently, the Just Add Fuel scheme was only available for drivers who were 21 and above (and had at least 2 years No Claims Discount). Just Add Fuel Telematics has been developed so those who are as young as 18 (who have from zero No Claims Discount) can benefit from an all-inclusive finance package as well. What is Just Add Fuel Telematics? for one monthly payment. With the challenge of getting your first insurance quote, many new drivers are intimidated by the huge costs involved. Just Add Fuel Telematics includes the cost of insurance within their finance package and many of our customers find it is cheaper than getting insurance alone. This is thanks to our Telematics Black Box System. This device is installed to your vehicle and tracks your driving behaviour. It is because this device that our insurance can be included in the price. Just Add Fuel Telematics prices shown on the site are examples as every driver is different. 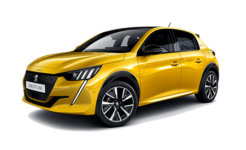 Financing your first car on Just Add Fuel Telematics means that you’ll receive an insured and regularly maintained brand new Peugeot 108, 208 or 2008 with inclusive road tax. It will also give you (or your family) the assurances they need that you’ll be safely driving thanks to the Telematics device. What is Passport and Passport Pro? 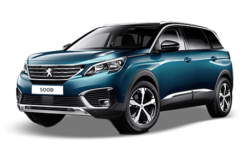 Peugeot Passport is a Personal Contract Purchase finance scheme made to keep monthly payments down. Our customers choose the vehicle they desire. The future value of the vehicle is then calculated (what the car is worth at the end of its contract) and our customers pay the difference. Pay the remaining value owed (the Guaranteed Future Value figure). The Guaranteed Future Value is calculated from industry data and the amount of miles you are likely to do over the contract. Customers are charged every mile that they exceed the agreed amount. The customer returns the vehicle with 20000 miles on the clock. If the excess mileage was charged at 8ppm (pence per mile) then the customer is liable to pay another £160 at the end of their contract. Our excess mileage charge is extremely reasonably priced but is necessary to ensure our Passport prices are kept correct. Passport Pro is identical but applies to businesses and Peugeot commercials. 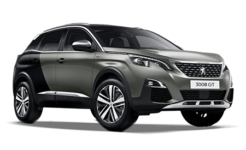 Motability is a charity that puts those with disabilities in the wheel of a new Peugeot. It is specifically for those drivers who receive one of the following. Is Contract Hire right for me? Contract Hire is a finance scheme that is often used by businesses. Whilst the monthly cost of the vehicle is kept extremely low, contract hire means that the customer will never own the vehicle. They are simply hiring it. This allows our customers to upgrade their vehicle more regularly (contracts range from 12 months to 48 months). Contract hire rates are dependent on annual mileage (like Passport) and an excess mileage charge will apply if the customers exceeds the agreed mileage. Contract hire rates are priced as either “maintained” or “non-maintained”. A maintained contract hire agreement allows our customers to keep their fleet expenditure fixed. Business Contract hire agreements are quoted excluding VAT and Personal Contract hire rates are including VAT. What is a guarantor (or guarantee) and will I need one? Sometimes when applying to finance a vehicle, we will require a guarantee (or guarantor). This is usually applicable to younger drivers or those with a lower credit score. A guarantee (or guarantor) is a another individual who countersigns your finance agreement. They promise to make your payments if you are unable to. This assures the finance company that you are responsible enough to keep up the payments. For further details, please contact our dealership. 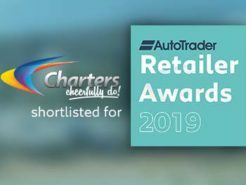 Charters Peugeot of Aldershot have been shortlisted as one of the top retailers in the country in the Autotrader Retailer Awards 2019. 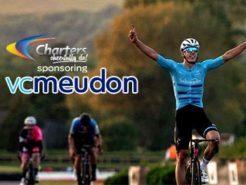 Charters Peugeot of Aldershot are proud to announce that we are supporting Canyon DHB professional cycling team for their 2019 season. 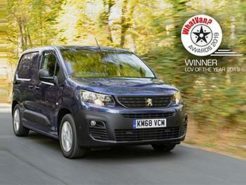 After scooping the envied International Van of the Year award, the new Peugeot Partner van continues to garner accolades by winning in the What Van? Awards 2019. 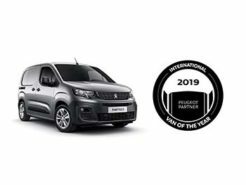 Before the new Peugeot Partner van has even been released in the UK, it has already been awarded the International Van of the Year 2019. 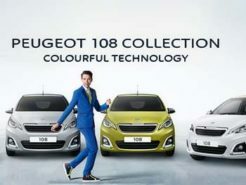 Looking for a more affordable way of driving a new Peugeot? The Just Add Fuel® scheme allows you to add Free Comprehensive car insurance to your finance agreement. If you run a local business in the Aldershot, Farnborough or Camberley district or even further afield, our Business Centre Manager is here to help you complete your fleet. © Charters of Aldershot. All rights reserved.